There are only a few dining places that have delectable chicken wings that you would want to visit all the time. Southside Chicken is definitely one of them. This place do not need any marketing advertisement. The place grew in popularity through word of mouth -- through testimonials. The restaurant is actually a portion of the owner's family home. Orders are cooked in their family kitchen. In Cebu, that is a common find. If you have a big unused space at home, you can use it for your business. Simple! It saves up rent too. Cajun Glazed Wings. This is my personal favorite. Inferno! Wings. If you like spicy food, you will love this. All viands are best eaten with garlic rice. 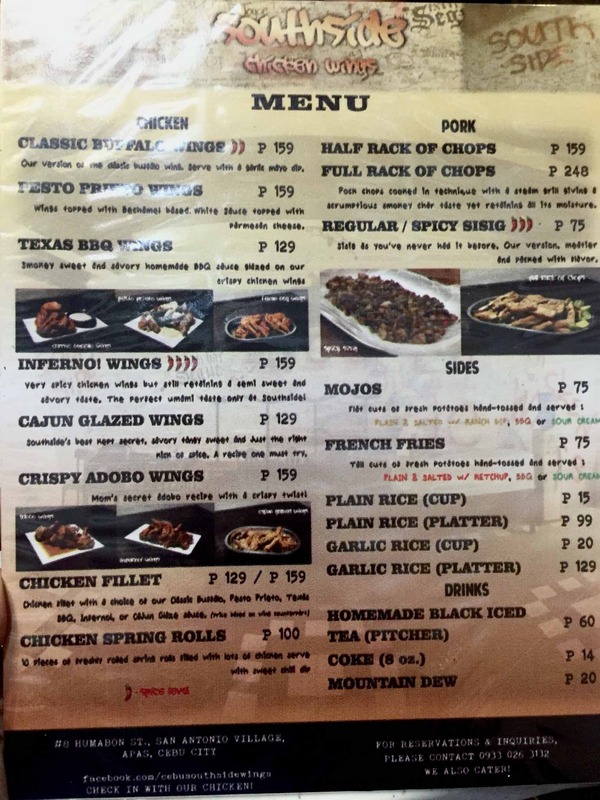 Southside Chicken is located at #8 Humabon Street, San Antonio Villlage, Banilad, Cebu City. If you're coming from Country mall going to Camp Lapu-Lapu, Humabon street is the 1st right after Montebello. Just follow the road. It's the house at the right with a sign that says Southside Chicken.